Lord help me, I've become a serial DIYer. roughing out the design to make sure we had enough. I blame it on Garden Walk Buffalo sponsor Italian Marble and Granite. 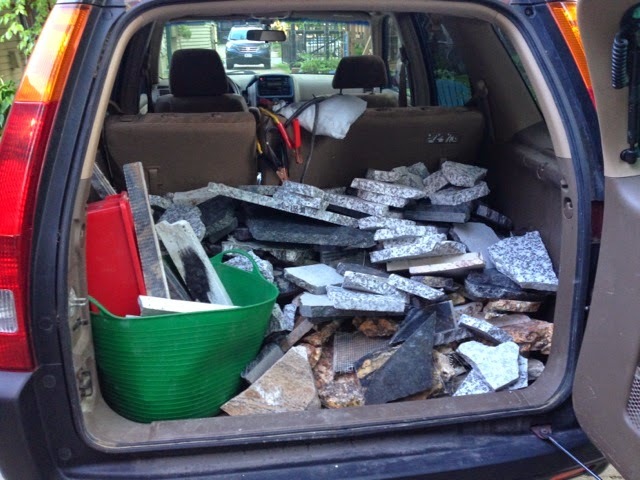 This year they've offered to any gardener on the Walk free marble and granite countertop scraps to anyone that wants them for a creative project. On top of that, they will judge the projects in advance of the Walk and a winner will be announced. The winner will receive a $500 gift certificate for a custom marble or granite project in their home. I really wasn't going to do another large-scale project before the Walk. I did my hanging succulent garden, and that was going to be my major Garden Walk project this year. 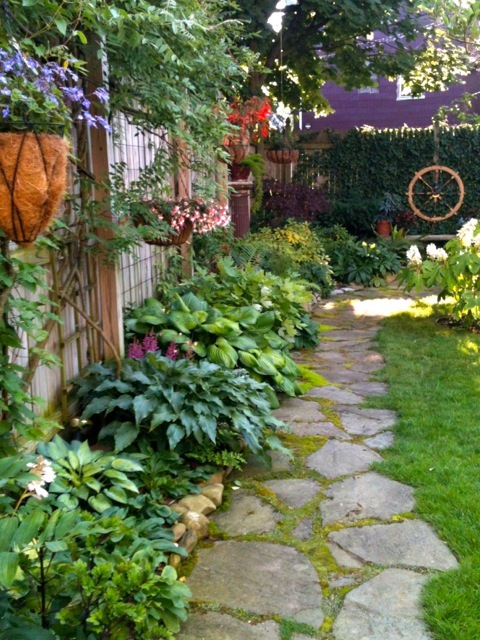 I try to do one unique garden feature each year, with the deadline being the Walk. This makes two. 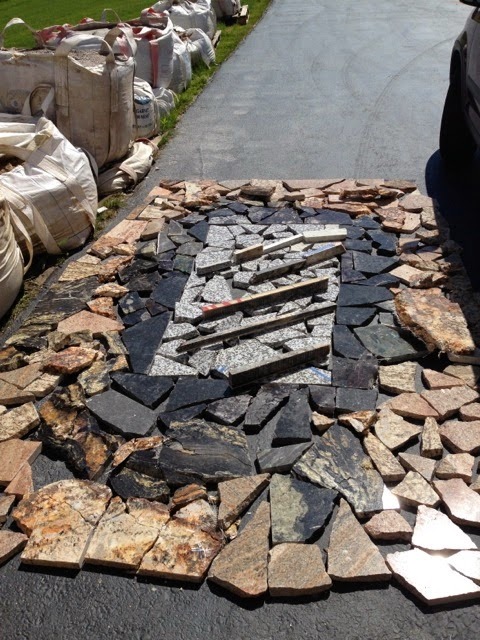 I've wanted to do something like this for years, but how often does someone come along and say, "You can have all the granite and marble scraps you want, you just have to come here to pick them up." They couldn't have made it easier for me if they'd tried. Well, okay, they could have delivered it, but, hey. I had a general idea of what I was going to do, but much is determined by what scraps are available at the time I hit the dumpster. It changes every week. All scraps are left over from countertops and other slab projects. We had to rough out the size and design in the parking lot next to the dumpster to make sure we had enough of each color and size of tile. If I went back this week, it'd be an entirely different-looking project. After it was laid out on the ground, it had to be all picked up and put in the car. Then taken out of the car once we got home. So far, each piece has been lifted three times. Much thanks to my darling sweet 16 year-old for the help. She wanted either cash or McDonald's for her efforts. She settled for just one more day's worth of room and board. After unloading, it was sorting by color, and by whether or not a piece had one cut straight edge (or close to it). Then, lifting each piece again, it was roughed out alongside the area in which it was going to be placed. 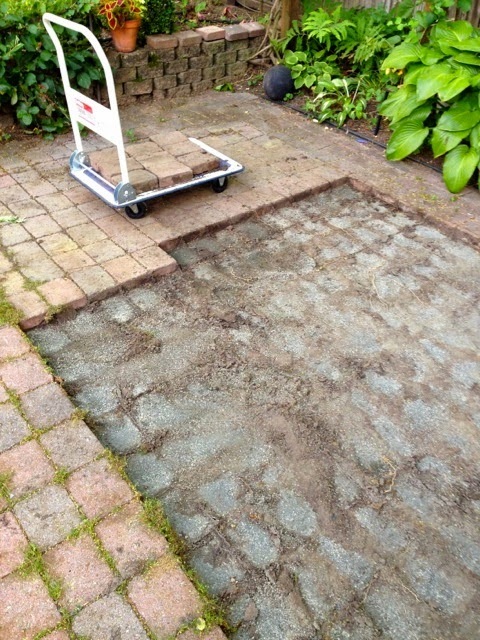 I already had a brick patio in the spot, so I had to removed the bricks where the "marble carpet" was going. It already has a layer of denatured crushed gravel on top of water porous weed barrier. So no serious digging had to be done. Each piece had to be lifted, for the last time, and put in place in the largest (and heaviest) jigsaw puzzle I've ever worked on. 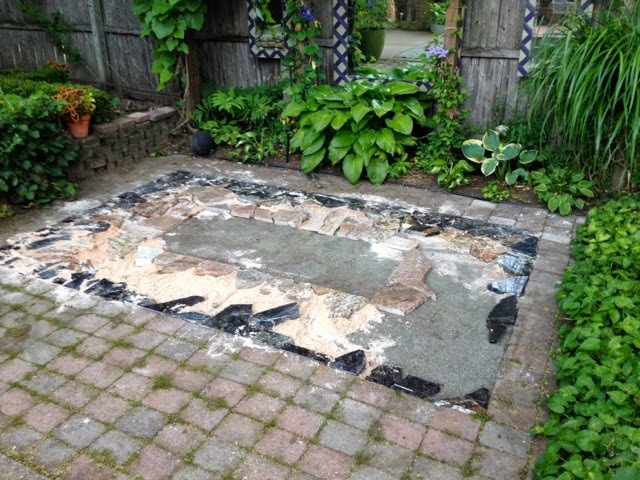 I used the black and darker scraps, with straight edges, to delineated the "carpet" from the outer brick. Then I used transition brown pieces with some black in them going towards the middle, with mostly-brown/tan pieces around the center rectangle. The center rectangle was made of black and white speckled granite. 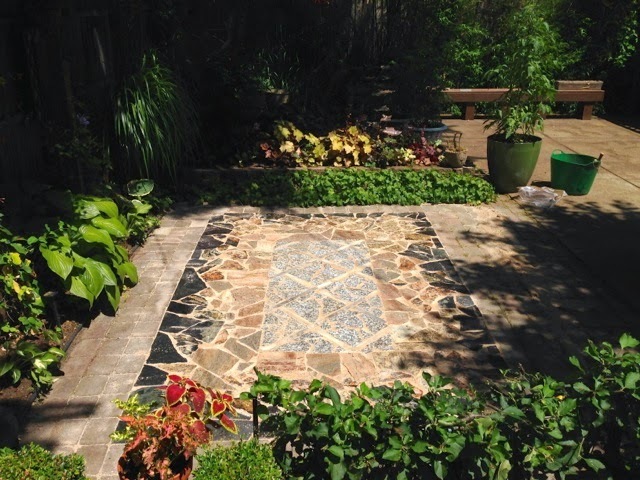 I created a diagonal square pattern in the center to mirror the diamond-shaped espalier, the checkerboard garden, and other features in my garden that have diamond shapes. 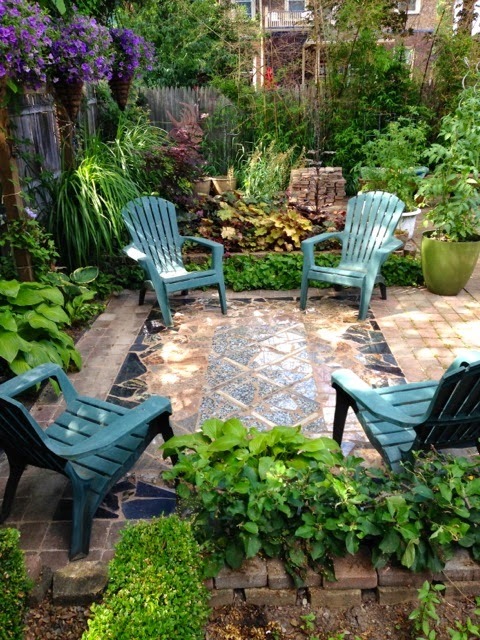 I try to incorporate the diamond shape into every project to tie the garden together. 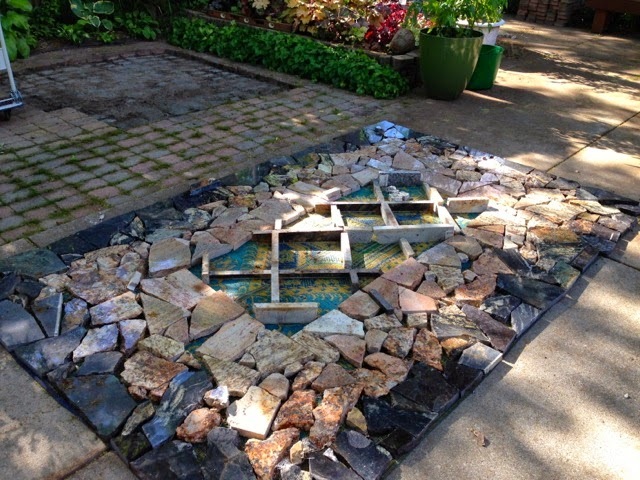 Once it's ll in place, It needs a sand/small gravel mix to "lock" the stones in place. This is a process of sweeping it into cracks thoroughly, wetting it down, sweeping it more, wetting it down and sweeping. I fully expect to be doing this for days and weeks as I have time. 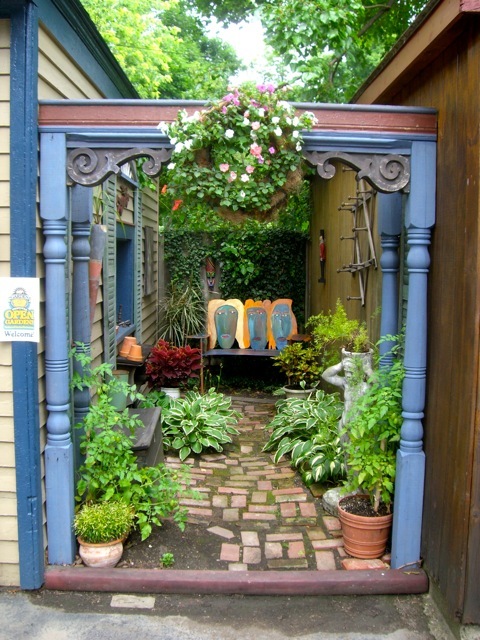 It's not as color coordinated and "matchy-matchy" as the blue outdoor carpet that was there, but boy does it look nice. And it'll last long than the outdoor carpet too. What a great project! 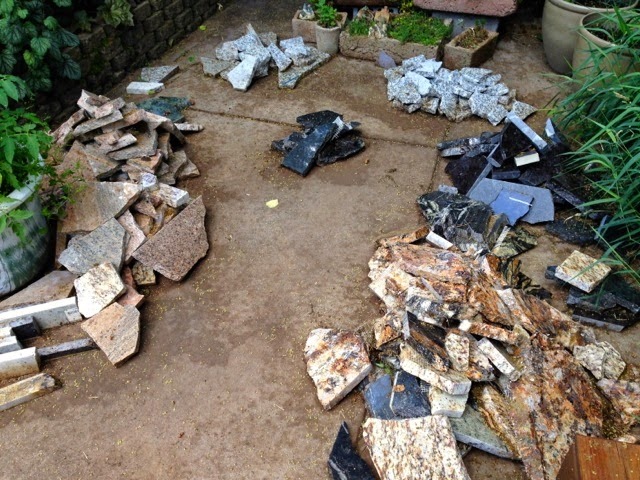 If someone offered me free marble and granite scraps, I'd be all over it. :) Out of curiosity, do you have wood spacers between the diamonds in the final state, or were they just used during the construction process. Those are not wooden spacers, but thin-cut marble strips, each about an inch or more wide. Oops, sorry about that. I couldn't tell on my computer screen. Those sound really nice! Love your rug. Nice job, Jim. By "rug" you're not implying I wear a hairpiece, are you Donna? Ha, ha, never even crossed my mind. 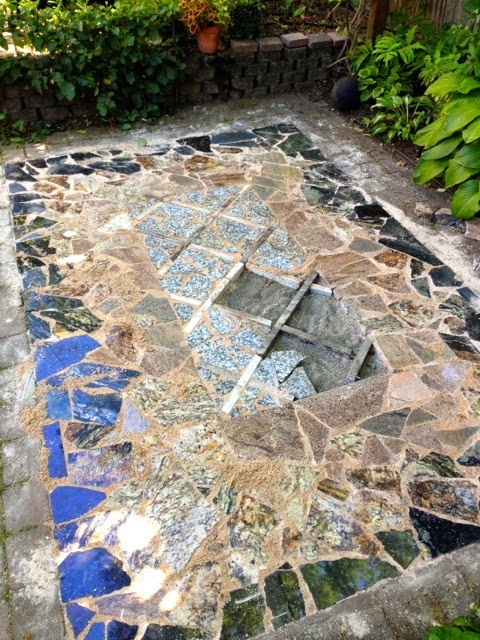 I was just at an open garden in Hamburg today that just "floored" me. If you did not get out to see the new one, Whit's End in the Southtowns, you really should. I am guessing you did though since the photo is in the book. I have not been out there. They supplied the photo in the book. Now I WANT to get out there. Very cool. 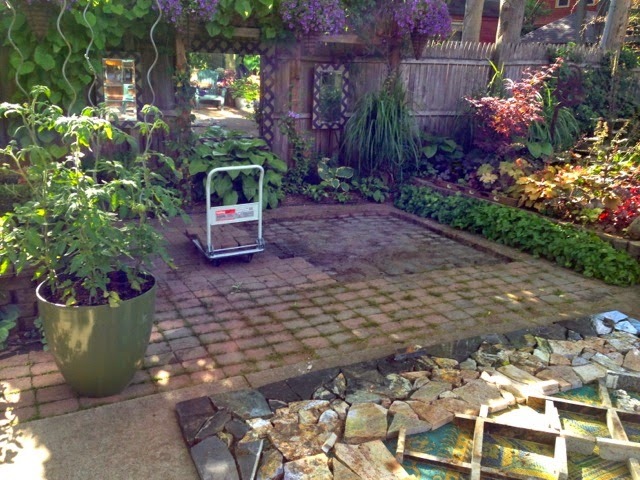 Your idea has been officially borrowed for thinking about finishing the floor of the basement patio. Any input I can have towards the little house in the woods I am pleased with. Especially if I don't have to lift a finger. You must be very good at solving jigsaw puzzles, because this is the biggest and toughest one I've seen (since there wasn't a "finished" picture to guide you)! The finished design is amazing, and so symmetrical, and to think you did it from scraps..really, my hat's off to you. Congratulations Jim. A well deserved win. Your hanging succulents deserve a prize as well. 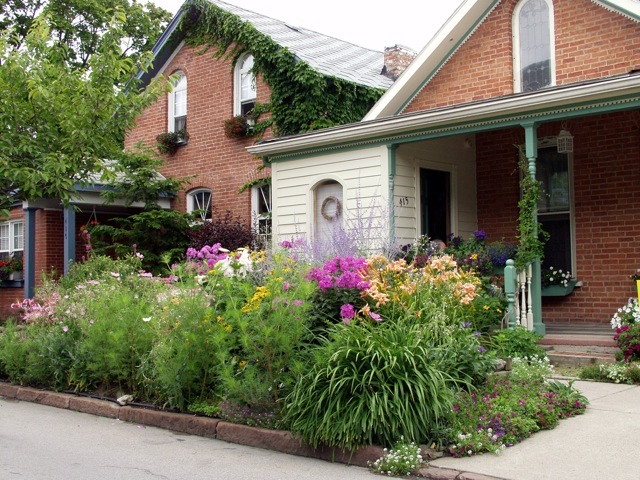 I can't wait to see what you add to the garden next year. 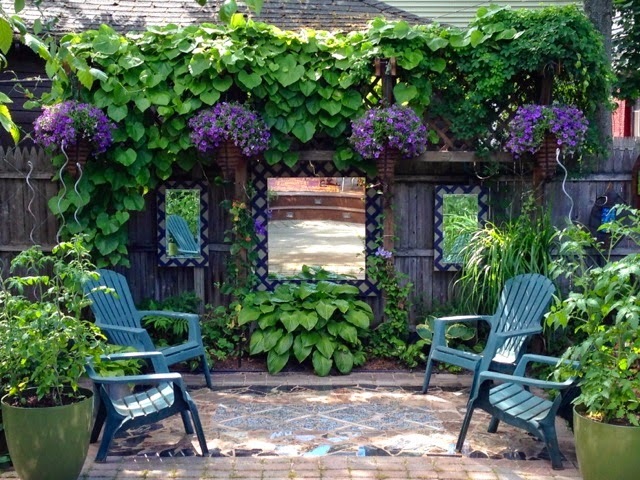 Looking forward to seeing you at the Garden Bloggers Fling next year. 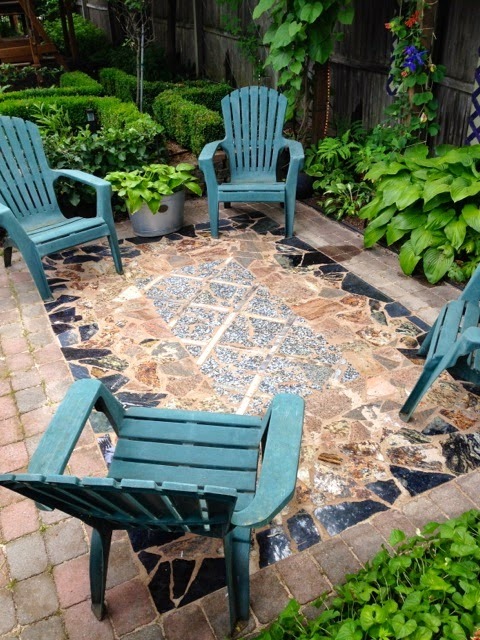 Marble tiles make garden area beautiful. Buy makrana marble stones with different pattern.